The pic above is not one of my favorites, but don't let that deter you from trying this yummy marinade on tri-tip. It just has a nice herbed flavor, and if you don't suffer from hypertension and can use full-salt soy sauce, it will be even better. I got this recipe from my sister-in-law, who is married to my brother. I've had the pleasure of enjoying this recipe twice with them: the first time in Florida when my brother was retiring from the Air Force and the second time at their new home in New Mexico. Both times I raved about its deliciousness and asked for the recipe. My brother and his wife have four boys ages 12 and under, so, well, it took a little while for Heidi to get me the recipe. It was a nice surprise when it showed up in my email about a month ago, and since then I've made and loved it twice. It's fabulous and my whole family loves it. Tastes great leftover too. 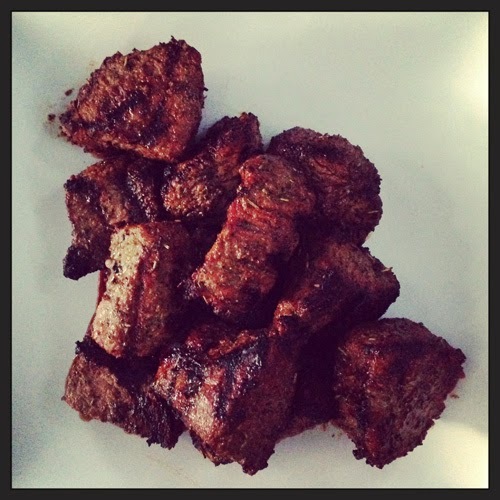 So, if you're a fan of grilled beef, you really need to give this recipe a try. I'm pretty sure you won't be disappointed. *Note: Heidi says you can adjust the amounts of each herb to your liking. She suggests starting with slightly smaller amounts of the dry ingredients you're not sure about and then smelling the mixture to see if it needs more of something. I just followed the basic recipe she sent and was very pleased with the results. In a medium sized bowl, mix all ingredients except the meat together really well. Place meat chunks in a zip-top bag, add the marinade, zip the top, and gently squeeze around to evenly distribute the marinade over the meat. Place bag on a plate or in a glass pan and refrigerate 2 hours to overnight. Remove from refrigerator about an hour before you plan to grill. Heat grill on high to about 500 degrees Fahrenheit. Place meat on hot grill, turn every 3-4 minutes, and check internal temperature with a meat thermometer when it's browned on all sides. When temperature reaches 145 degrees, remove to a heat-proof plate/dish. Allow meat to rest for about 10 minutes before serving.